Simulated practice learning is used in pre-registration nursing programmes to replicate situations that nursing students are likely to encounter in clinical practice, but in a safe and protected academic environment. However, lecturer-led simulated practice learning has been perceived as detached from contemporary nursing practice by some nursing students. Therefore, a pilot project was implemented in the authors’ university to explore the use of student-led simulated practice learning and its potential benefits for nursing students. Aim To evaluate the effectiveness of student-led simulated practice learning in pre-registration nursing programmes. The authors specifically wanted to: enhance the students’ skills; improve their critical thinking and reflective strategies; and develop their leadership and management techniques. Method A literature review was undertaken to examine the evidence supporting student-led simulated practice learning. 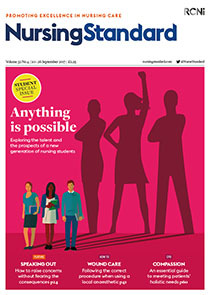 A skills gap analysis was then conducted with 35 third-year nursing students to identify their learning needs, from which suitable simulated practice learning scenarios and sessions were developed and undertaken. These sessions were evaluated using debriefs following each of the sessions, as well as informal discussions with the nursing students. Findings The pilot project identified that student-led simulated learning: developed nursing students’ ability to plan and facilitate colleagues’ practice learning; enabled nursing students to develop their mentoring skills; reinforced the nursing students’ self-awareness, which contributed to their personal development; and demonstrated the importance of peer feedback and support through the debriefs. Challenges included overcoming some students’ resistance to the project and that some lecturers were initially concerned that nursing students may not have the clinical expertise to lead the simulated practice learning sessions effectively. Conclusion This pilot project has demonstrated how student-led simulated practice learning sessions could be used to engage nursing students as partners in their learning, enhance their knowledge and skills, and promote self-directed learning.